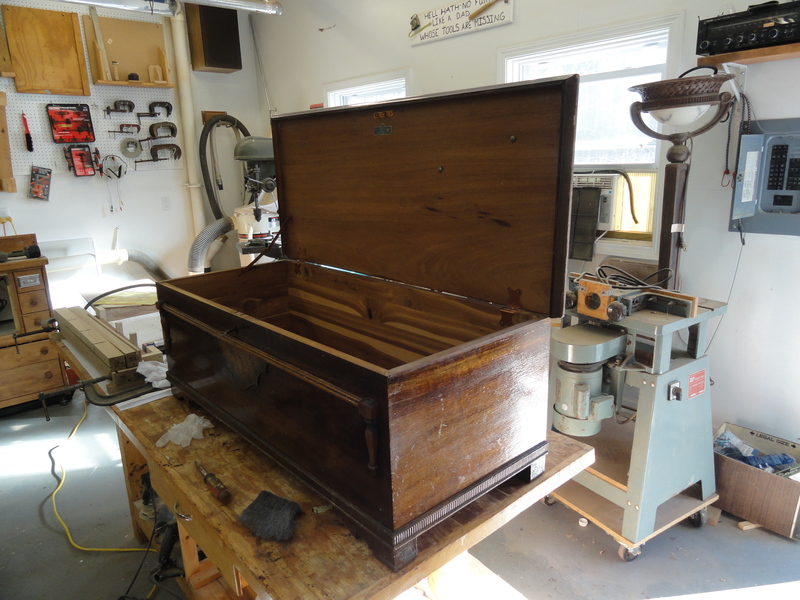 My sister, Amy, Asked me to refinish a cedar chest that has been in the family for some time. 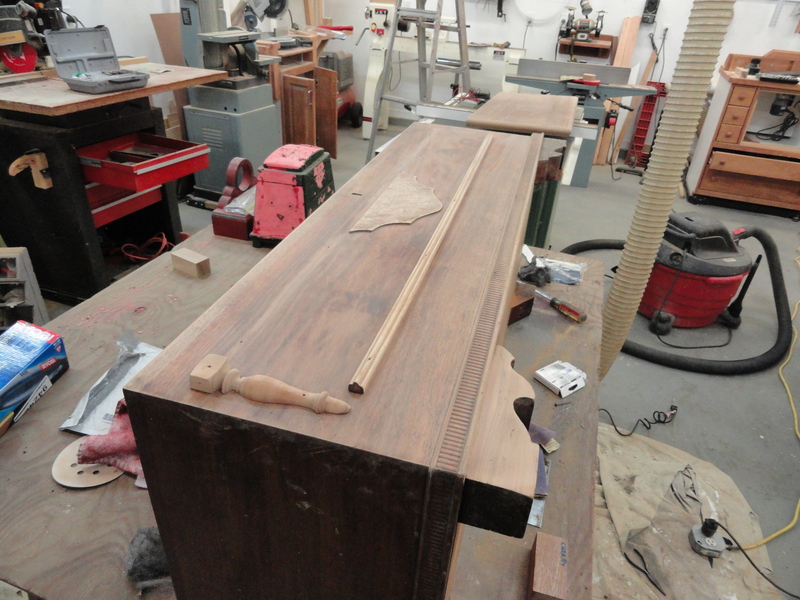 As usual, it looked pretty rough coming into the woodshop. Somebody has obviously put on a coat of glossy urethane on what probably should be a shellac finish. The bottom feet were a little rough and later, after I researched the manufacturer, I discovered the feet were actually missing. The interior is in very good condition. It is unfinished cedar. With a little sanding, it will look and smell like new. The exterior was difficult to judge because of the glossy finish. I quickly sanded a small section and discovered a beautiful walnut veneer. This should be really something once all the old finish is removed. I always like to research the manufacturer to see if I can date furniture that comes into the woodshop. 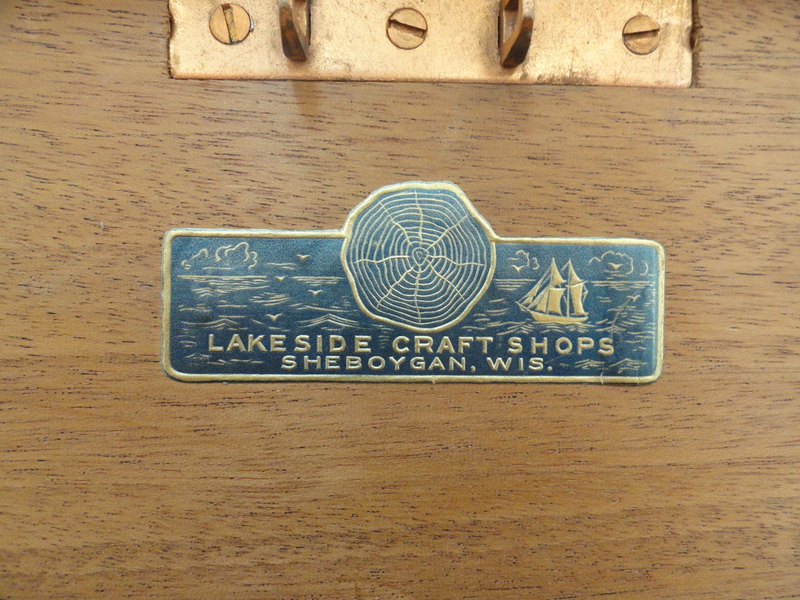 It turns out that this cedar chest was manufactured by Lakeside Craft Company in Sheboygan, Wisconsin. Based on what I found on the internet, this cedar chest was probably built between 1912 and 1919. I will keep looking for more information to see if I can get closer on MFG date. The first step in the process was to strip the top to confirm the wood underneath the finish was worth the effort to refinish. Once all the finish was removed, I was able to confirm that it is an unusually thick walnut veneer (0.040″) with what looks like cherry or maybe mahogany surrounding the perimeter. The top cleaned up real nice. My next concern was the front face of the chest. There is a decorative burl maple insert, some trim pieces and dental molding around the bottom perimeter. These can be a real problem to clean the finish off without damaging the wood. Everything cleaned up ok. Not perfect but close enough where I can get a good finish on the product. I was also able to remove some of the trim pieces without damaging them. 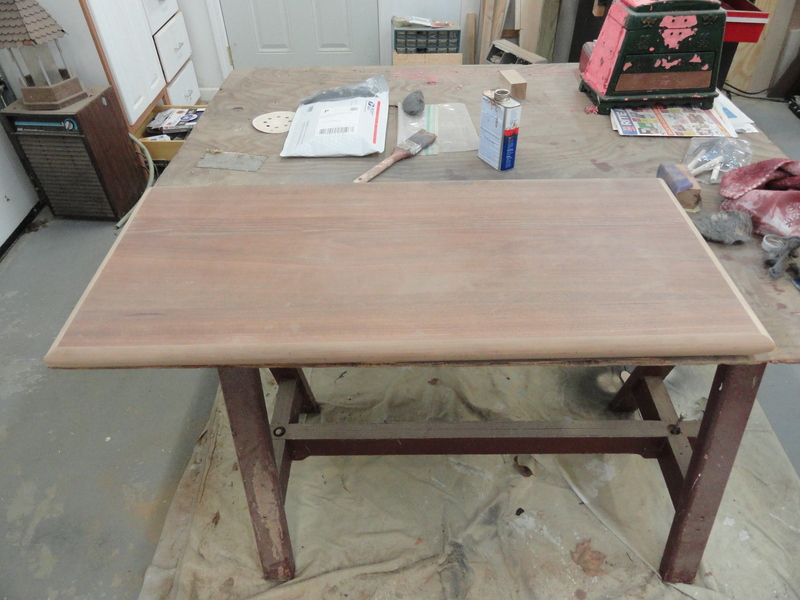 This makes it much easier and less time-consuming to sand down the walnut veneer. I assume it will take me another two weeks to remove the remaining finish and sand the chest so it is ready for the new finish. In a later post I will discuss the missing feet. I need to negotiate with my sister to see if she will let me return it to the original condition. I am also considering the stain color and appropriate finish. It will probably be shellac. More to follow in the next couple of weeks. Only I am lucky enough to have a brother who is so insanely busy that loves me enough to take a piece of furniture that I love so much and bring it back to life. Even if me crying as a baby kept him up at night… Love you big brother!